Ulysses Simpson Grant was born in Point Pleasant, Ohio, on 27 April 1822. He graduated from the United States Military Academy in 1843 and commissioned in the infantry. After graduation, he served with the 4th Infantry and participated in the occupation of Texas from 1843 to 1846. Grant fought under Generals Zachary Taylor and Winfield Scott in the Mexican War, distinguishing himself at Molino del Rey and Chapultepec. During the war, he was brevetted first lieutenant and captain. After the war, he married Julia Dent. In 1847, he received the permanent grade of first lieutenant. He became the quartermaster for the 4th Infantry and eventually was promoted to captain. In 1854, Grant resigned from the Army to pursue opportunities in farming, real estate and other fields. He proved generally unsuccessful in these ventures from 1854 to 1861. In 1861, Grant was made a colonel of the 21st Illinois Volunteer Infantry, and was soon promoted to brigadier general. Grant commanded the Union forces at the battles of Fort Henry, Donaldson and at Shiloh in 1862. In February 1862, he became a major general of volunteers. Grant besieged the Confederate forces at Vicksburg. The city surrendered on July 1863 and Grant was made a major general in the Regular Army. Later that year, he won at Chattanooga. In March 1864, Grant was promoted to lieutenant general, and commanding general of the Army. He served as commanding general from 9 March 1864 to 4 March 1869. Grant and Confederate General Robert E. Lee squared off in the final months of the war; Lee surrendered to Grant at Appomattox Courthouse in April 1865. Grant then commanded the Army during Reconstruction. He became a full general in 1866. Grant was elected President of the United States in 1868; he served until 3 March 1877. Then he traveled to Europe for three years and ran some unsuccessful business ventures. 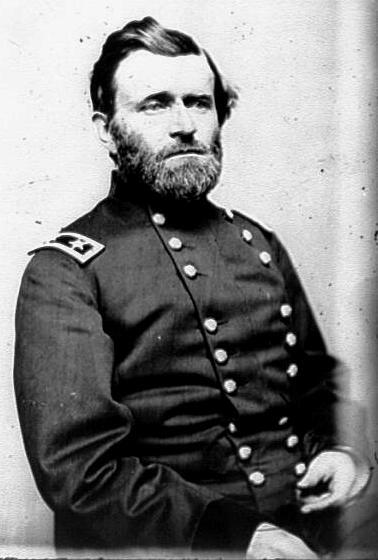 In his final days, Grant wrote his Memoirs and was reappointed a general in the Army and placed on the retired list. Grant died in Mount McGregor, New York on 23 July 1885.